Yesterday I waved good-bye to three of our grandchildren who had been staying with us for six days. They had come the day after our other four grandchildren (and their parents) left after living with us for six weeks. 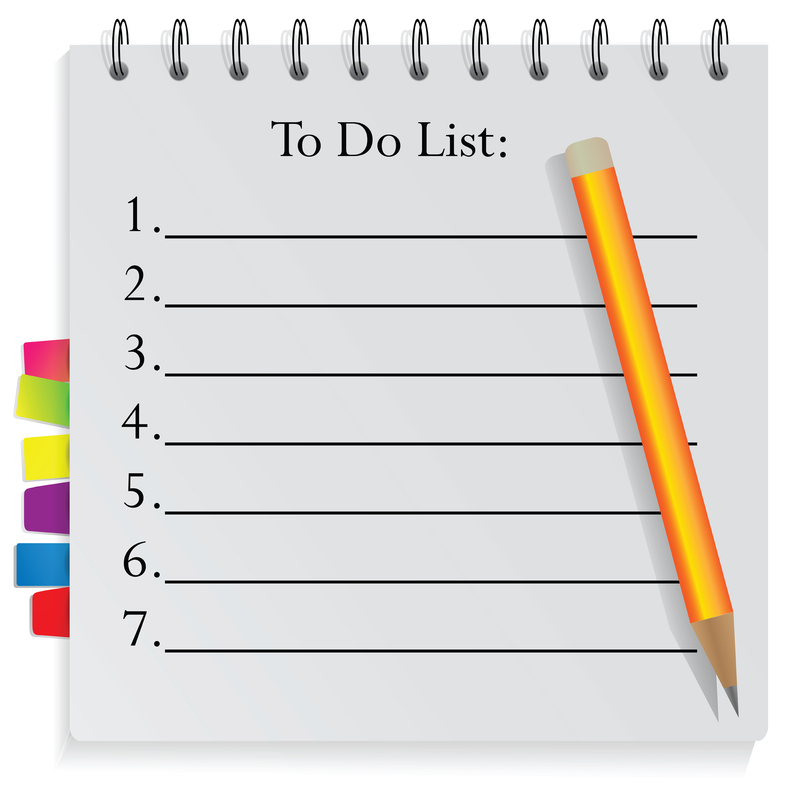 Housing seven grandchildren in seven weeks was the result of giving my to-do list over to God years ago. As a woman who loves order and finds great satisfaction in making lists and completing what’s on them, I testify to God’s good work in me. In fact, saying yes to God’s plan for those 7 weeks left little time for making lists at all. Other things my flesh yearned for had to go as well, such as time by myself to recharge my batteries (little children never need their batteries charged) reading, or putzing around the house (making things orderly). But while I felt stretched in a number of ways, I’ve learned that there’s great joy in doing the work God has assigned, even if it means laying other good things aside. The Bible teaches that, whether we tend to live each day with a clear agenda, or have no particular plan at all; we could be in danger of either missing the good work that God wants to accomplish in our lives, or missing divine opportunities that He’s prepared for us to serve others in His name. For by grace you have been saved through faith. And this is not your own doing; it is the gift of God, not a result of works, so that no one may boast. We are His workmanship, created in Christ Jesus for good works, which God prepared before hand, that we should walk in them Ephesians 2:8-10. God saved us by grace, through faith that He provided. Likewise, God is working to deliver us from our natural bent toward serving self by giving us good works to do for the glory of His Name. Whether we are Type A or Type C by nature, God wants us to do only that which He has called us to do. Just like Jesus, who said; “The Son can do nothing of His own accord, but only what He sees His Father doing. For whatever the Father does, that the Son does likewise. For the Father loves the Son and shows Him all that He Himself is doing.” John 5:19-20. I have learned in my six decades that, while I still battle selfish desires and ambitions, when my heart is bent towards prayer and obedience to God’s Word and Spirit, the Spirit is faithful to show me my work each day. And when I keep in step with the Spirit, God gives me great joy and uses my life to bless others. Not that I always listen perfectly. But I have found that as I prayerfully make my plans, keeping the following things in mind helps me trust God when He chooses to revise my plan on any particular day. 1. Remember that, by nature, our plans often lean toward serving self interests, and boasting in our own good works. Have you noticed how often God calls us to obey and serve in circumstances that reveal our sin? For example, being a wife exposes the selfishness and stubbornness at work in my heart when my husband’s decision doesn’t go the way I’d like it to. Having children revealed impatience when we were late to an appointment and couldn’t find a shoe. Being an employee has shown me how much I like to be my own boss. God ordains circumstances and people that require us to die to self in order to exalt Christ. He knows that serving our own agenda, whether it is to get our husband to agree with us, our children to fall happily in step with our plans, or for those we work for to see things our way, will never ultimately provide the satisfaction that obeying Christ brings. We must maintain an ongoing spirit of prayer throughout our day or we will have a hard time discerning what to say yes or no to. The Holy Spirit leads those who depend on Him. 3. Recognize that the work God has prepared for us provides daily opportunities for new applications of gospel truths, as well as opportunities to choose sacrificial obedience. Serving nearly always requires sacrifice which helps us remember what Christ sacrificed for us. That doesn’t mean we won’t experience joy and blessing, but it will require us to give of ourselves in some way. Depending on the circumstance, serving might cost us time, comfort, resources, energy, or whatever else God asks us to put on the altar for Him. Something I learned the hard way is that sometimes we jump in to serve where God has not called us. I find I am most vulnerable to this when I fail to take time to pray and talk it over with my husband first. Here are some helpful questions to ask when a need is brought to your attention. Have I taken time to pray and align my thoughts with God’s Word? If married, have I talked to my husband? If unmarried, have I invited a mature believer who knows me to speak into this? Do those I trust affirm this decision? For longer term commitments; how would this impact current responsibilities to my family, home responsibilities, or other commitments I’ve already made? Is God asking me to put other things aside (even a night at home) to meet this need? We must be careful that we don’t say yes just because we know we could do something or say no simply because we’re super busy (we could be busy with the wrong things). While rest is surely a legitimate need, I’ve noticed that women who have overcommitted in the past can swing the opposite way in an effort to create protective boundaries. If we become too hyper focused on what fits our schedule at any given time, we can miss one of God’s divine appointments. Christ often calls us to stretch beyond our capacity to show us that our strength comes from Him and not ourselves. 4. Be at peace when the day’s work you had planned fails to get done if you have been redirected by the Holy Spirit. Remember that any work done in joyful obedience to the Lord Jesus will receive a far greater reward than the short-lived good feeling of checking items off our daily lists. When my children and grandchildren were living with us, many things had to go on the back burner. I had piles (and I hate piles). I had so much ironing that I was running out of clothes to wear! I was way behind in emails and other correspondence. I was tired most of the time and my normal routines needed to be set aside. But, in spite of all this, I knew I was right where God wanted me. My husband and I had prayed and were united in our invitation. We were seeking to serve our children and grandchildren for God’s glory, not our own. There was a need (at a time when we were already busy and low on energy) and we knew it was God’s appointment for us. While it did cut into other commitments, we believed God was calling us to lay those things aside for a time to obey Him in the work that was prepared before we were born. Thus, while there was often chaos around me, there was peace in my heart. I am enjoying the quiet and order that has returned to my house but I thank God for all the ways He used my offering of time and energy to work Himself more deeply in my soul. God’s plans are always better than our plans, because He uses them to serve His purposes and make us more like HIm. As God leads us to the only work that will bring eternal joy, it will require laying our lives down for the sake of others. Just like Jesus. Thank you dear friend! I was seeking the Lord this morning as I made a to-do list for my 5 week “break” leading up to September. I consider it a rough draft as I lift it up to Him with open hands, praying for the wisdom and humility to heed His edits. First thing on the list is pulling an enormous amount of giant weeds in my yard before they completely overtake my flowers. There are a few spiritual lessons to be pondered there as I work! It’s so true, Sue. I am pretty sure that’s the only value of weeds, to remind us of all the spiritual analogies! Such a joy for me to find your blog today. Reading this morning your words, have put my heart to rest – and I’ve been encouraged to give all the stirrings I have to Jesus! He has a perfect list for me. Love being reminded, even Jesus only did as His Father instructed. So good to remember! My heart is full with the joy of the Lord. Waiting on Him and expecting His blessings! Thank you Sonja! We all need these reminders, don’t we? He never disappoints those who wait for Him!